Q. 951: Which process uses occurrence probability and impact on project objectives to assess the priority of identified risks? Q. 952: What are the five Project Management Process Groups? A. Establish the scope, objectives, and course of action of a project. B. Define a new project or a new phase of an existing project. C. Track, review, and regulate the progress and performance of a project. D. Complete the work defined in the project management plan. Q. 954: A work package has been scheduled to cost $1.000 to complete and was to be finished today. As of today, the actual expenditure is $1,200 and approximately half of the work has been completed. What is the cost variance? Q. 955: The following chart contains information about the tasks in a project. 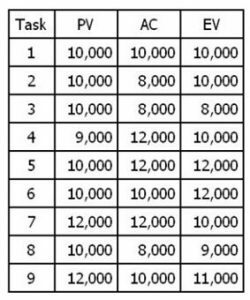 Based on the chart, what is the schedule variance (SV) for Task 8? Q. 956: Which of the following is an input to the Develop Project Charter process? Q. 957: Which of the following are outputs of the Monitor and Control Project Work process? Q. 958: The milestone list is an input to which process from the Planning Process Group? Fast tracking is a way to accelerate the project schedule. Q. 960: What would changes to an approved baseline not result in? Baselines include scope, time, and cost. There is no such thing as a charter update.